At the south-eastern extremes of the St Emilion plateau, the steeper hillsides crowned by Château Troplong Mondot are known as the Côte de Pavie and play host to some of St Emilion’s most exciting vineyards. Not least among them are the various Pavie châteaux, but this is also home to Château Larcis Ducasse. The Larcis name seems to have been used for a wider area of vineyard on the Côte, a lot of which is now part of Château Pavie, whilst the Ducasse comes from a one-time owner, one of several Duscasses to have made a mark in Bordeaux. Henri Raba purchased Château Larcis Ducasse in 1893 and the estate is still owned by his descendants today. Since 2002, Larcisse Ducasse has been managed by Nicolas Thienpont, who also manages Pavie-Macquin, and whose family are intimately woven into the fabric of modern St Emilion; he has been notably assisted by another St Emilion superstar Stéphane Derenencourt. The 11ha of vineyard are planted with 78% Merlot and 22% Cabernet Franc, with an average age of 35 years. 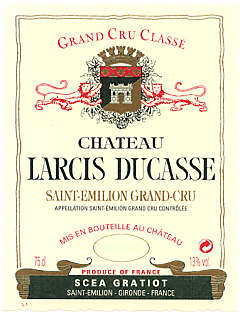 The on-going success of Château Larcis Ducasse, and the quality of its terroir, was rewarded with the status of Premier Grand Cru Classé (B) status in the 2012 St Emilion Classification.